Friday will mark the various candidates vying for an MLA seat at the provincial politics table being asked several questions from school youth at a forum held at Central School. 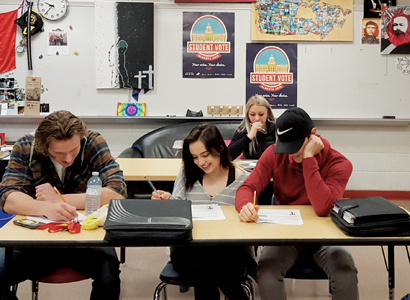 W.R. Myers Social Studies program participates in the Student Vote program whenever an important election comes Alberta’s way, be it on the provincial or federal scale. It is a program conducted federally to help engage students in the democratic process. Voter turnout in Canada is lowest for young voters. A general decline in electoral participation among the under-35 population has been observed in many democratic countries around the world, especially in Canada. Programs like Student Vote hope to reverse that trend and educate high school students on the various processes that happen in government that affect our everyday lives. Many youth may think…who cares? And they very much should. On the cusp of adulthood and either entering the workforce full time or taking education in the trades or post secondary, even now a teenager’s life is being affected by the political powers that be. Minimum wage, level of education delivery, daycare costs, and family tax credits are just a few of many issues that affect a teenager’s family unit. W.R. Myers School should be commended for getting kids plugged into the political system and helping spearhead Friday’s forum for youth. On the cusp of being able to vote, a more-informed person casting their ballot is better for everybody. Youth should be served in their voice being heard in how our democracy is shaped, as leaders of tomorrow — and if motivated enough — today.